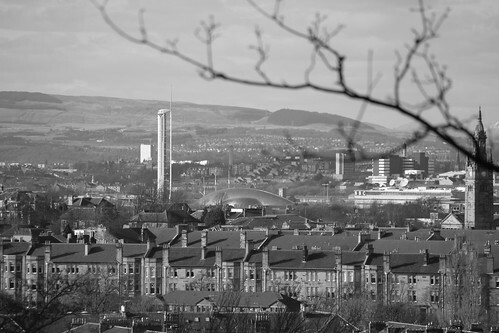 Slightly to the left of yesterday’s picture, this one shows the view looking towards the Glasgow Tower, and just to its right the Science Centre and IMAX Cinema. 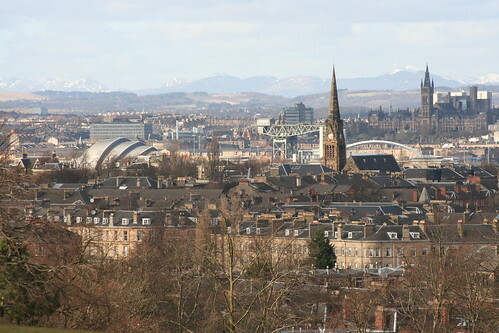 To the right of that you might also be able to make out the BBC studios at Pacific Quay. I know this blog is on a bit of a hiatus, but after a few weeks of work and a few days of a nasty tummy bug, I thought I’d go for a restorative walk round Queen’s Park, and try out my new zoom lens at the same time. At the small pond there were lots of people pointing and taking photos, and when I got close I saw why. There was quite a bit of X-rated froggy activity going on, and lots and lots of spawn already. 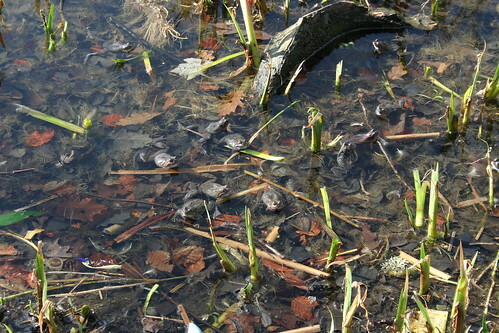 I can see 12 frogs in this picture – can you see any more? (I’ll show a couple of views I took over the next couple of days to show off my new toy).